Outside laminate and resin infusion in one injection shot. Laying out the dry stack of glassfibres, all the infusion consumables and the infusion of the laminate in one shot. You can find the photo’s in this album. The video below is till the moment the resin front reaches the deck line (due to exposure limitations). 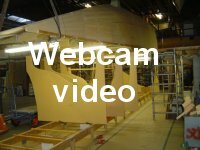 Open the album to see the joining of the two float halves and the other work on bow and stern.